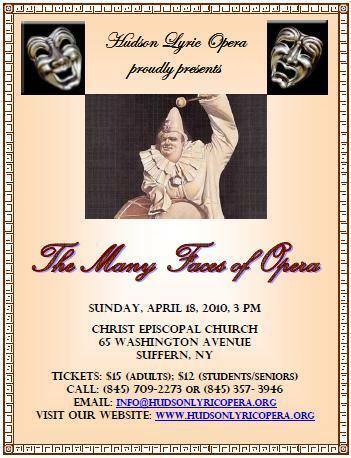 The Hudson Lyric Opera had a recital in 2010. The recital program was presented in the Spring. Some notes from that show are below. Welcome to the Hudson Lyric Opera. 47 East Main St, Stony Point, NY. 65 Washington Ave, Suffern, NY. Please call (845) 709-2273 or (845) 357-3946 for more information, or by email at info @ hudsonlyricopera.org .